Monday, November 3, 2014, 7 p.m.
Free. Reservations and photo IDs required. There is a quiet revolution going on in the world of art, a new avant garde pushing the boundaries farther than ever before. These are artists who work together with scientists to make extraordinary creations that may well change the world as we know it. From designer butterflies to plastic surgery as performance theater, from rabbits that glow in the dark to seeing sound and sculpting data, Arthur Miller will discuss this brave new world in his talk. What are some of the many sorts of art that spring from the interplay between art and science? How did this interaction begin and where is it going in the 21st century? How are concepts such as art and aesthetics being redefined? Are there similarities between the creative processes of artists and scientists and if so, what? These are some of the questions Miller will explore while looking in the exciting new art movement which he calls artsci. Arthur I. Miller is fascinated by the nature of creative thinking--in art on the one hand and science on the other. What are the similarities, what are the differences? He has published many critically acclaimed books, including Einstein, Picasso, Empire of the Stars and 137, and writes for the Guardian and The New York Times. An experienced broadcaster and lecturer, he has curated exhibitions on art/science and writes engagingly about complex social and intellectual dramas, weaving the personal with the scientific to produce thoroughly-researched works that read like novels. He is professor emeritus of history and philosophy of science at University College London. 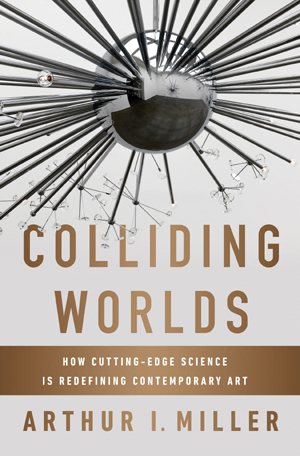 His book Colliding Worlds: How Cutting-Edge Science is Redefining Contemporary Art (W.W. Norton) tells the story of how art, science, and technology are fusing in the twenty-first century. To research it he interviewed leading figures in the world of contemporary science-influenced art and has spent time and lectured at CERN, the MIT Media Lab, Le Laboratoire, the School of Visual Arts and Ars Electronica. In 2013 he was a juror for the Prix Ars Electronica for Hybrid Art. See www.arthurimiller.com and www.collidingworlds.org.